Insolation - what is it and why is it Important? Insolation is a measure of solar radiation energy received on a given surface area in a given time. The name comes from a portmanteau of the words incident solar radiation. Knowing the amount of sun you will receive at your location is a fundamental piece of information used to calculate how much electricity your solar panels will produce. How Much Solar Energy Reaches the Ground? Only about 74% of the solar energy of the radiation from the sun that reaches the top of Earth's atmosphere passes through to the surface. Gamma rays, X-rays, and ultraviolet radiation less than 200 nanometers in wavelength are selectively absorbed in the atmosphere by oxygen and nitrogen and turned into heat energy. Most of the solar ultraviolet radiation with a range of wavelengths from 200 to 300 nm is absorbed by the concentration of ozone (O3) gas found in the stratosphere. Infrared solar radiation with wavelengths greater than 700 nm is partially absorbed by carbon dioxide, ozone, and water present in the atmosphere in liquid and vapor forms. Roughly 30% of the sun's visible radiation (wavelengths from 400 nm to 700 nm) is reflected back to space by the atmosphere or the Earth's surface. How Much Sunshine Do You Receive? The amount of insolation that an area receives can vary over the course of a day or over a year. The highest point of the Sun's path in the sky is the time when the maximum amount (intensity) of sunshine for the day reaches a location. The warmest part of the day is usually a few hours later. 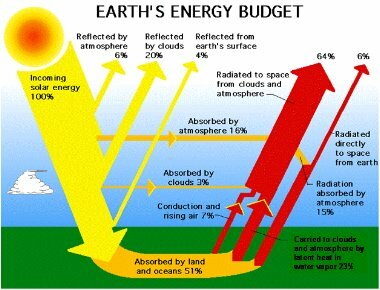 This is because the land absorbs the sunlight and reradiates it out to the atmosphere, warming it up. We measure the air temperature when giving temperature readings. The coldest part of the day is just before sunrise, when the Earth's surface has reradiated much of the energy it absorbed during the hours of sunlight. The incident solar radiation index you'll be working with is the sum of the direct sunlight reaching your panels and indirect or diffuse sunlight, meaning sunlight reflected by other surfaces and molecules in the air to arrive at the surface from all angles. On a cloudy day, one might not see the sun at all, but the region is still fully illuminated by indirect sunlight. Over the course of a year, the percentage of direct vs. indirect insolation varies by region, but a good rule of thumb is that about 2/3 is direct sunlight and 1/3 is indirect. 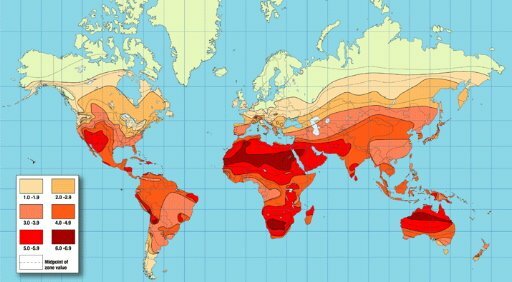 The total amount of sunlight you will receive per square meter depends on the latitude, the weather, the season of the year, and the time of day. These variables account for large differences in available insolation at any given moment in different locations around the world. Despite the differences, insolation on a 1 m2 surface perpendicular to the sun anywhere on Earth receives approximately 1000 watts (1 kW) of solar energy on a clear day. This figure of 1,000 watts represents "peak" power or maximum power, undiminished by fog, smog or cloud cover. Munich, Germany … which has a higher latitude than Boston has a level of 1,088. In other words Boston gets about 20% more sunlight than Munich. Note: US solar radiation data tends to be shown as a daily average, while European levels typically are shown on an annual basis. NASA collects data and provides this information for free. Go to their Atmospheric Science Data Center website. Enter the latitude and longitude of the area you are interested in (easy to find with Google Maps). Alternatively, you can select the area on the map. NASA collected 22 years of data, and provides the monthly averages for the location you are interested in. Click on the appropriate link to return to the top of this page about Insolation or to return to our overview about Solar Energy.